Upon arriving at this home in a wooded neighborhood near Radnor Lake in Nashville, guests might be surprised by the interiors unless they knew our client. In that case, friends would likely recognize the aesthetic and personality from a mile away and be able to match up the interiors with the homeowners immediately. From the hand-painted Mexican tiles inspired by an old magazine clipping our clients saved, to the playroom tucked under the over-sized kitchen island, friends would be able to pinpoint the client’s Hispanic heritage, love of color and love of family. Everything has a reason, a function, and most importantly, a story. Front entry way complete with custom door and a melange of custom colors inspired by travels to Mexico. One thing everyone comments on when they walk into the home is the strong, unabashed use of color. Even we have to admit they are gutsy and unique! Some might be surprised to see a brand new construction home infused with so much personality, intrigue, heart and soul, but that is the magic of a custom home, isn’t it? In a custom home, the clients, the design team, and the contractor come together to not only create a space that reflects the client’s personality, but also to take an objective look at every aspect of construction; Nothing is a given, everything is a decision. The result in this custom home is pure joy. Bright pink, deep blues, citrus greens – they are all at home! 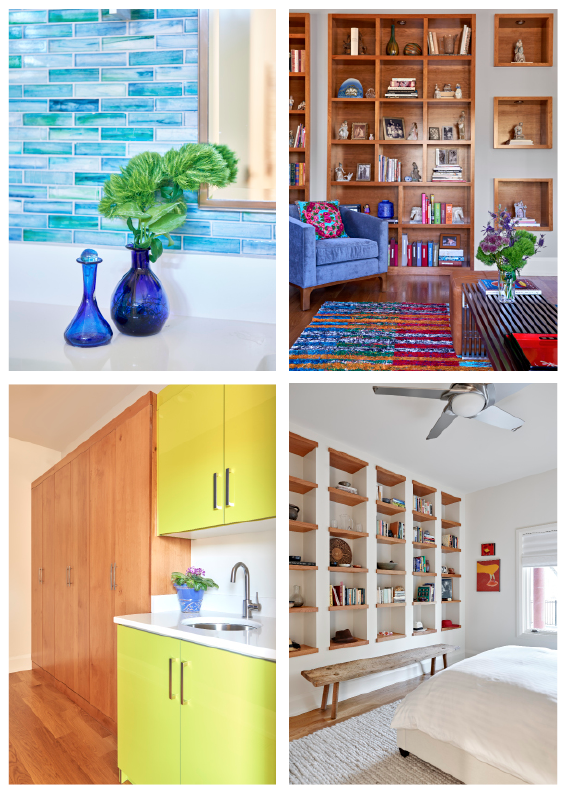 Our client loves color which was used inventively throughout the home. The open and bright entryway makes the perfect welcome area. 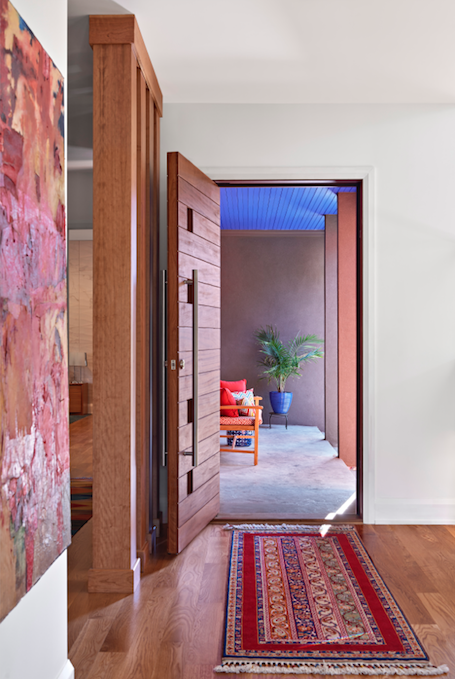 Warm wood tones, vibrant colors, custom stairway, and gallery wall featuring a collection of photos from the clients travels makes a strong design statement and sets the tone for the rest of the home. The miniature doorway under the stairs was designed to give access to the crawl space under the stairs, but we imagine the grandchildren are fascinated by the little door and have declared the space as one of their own! We loved designing the details of the kitchen and tailoring it specially to the homeowners cooking, storage and personal design aesthetic. First, was to layout the floor plan to create a chef’s kitchen that was at once hard working but also easy on the eyes. Next, we selected the finishes and fixtures to match the inspiration photos. Lastly, we stretched our imaginations to use every bit of the island which includes a small play space for the grandchildren. Not only does this space work as a great place to tuck away toys when they are not in use, it also is illuminated so the kids can play while everyone gathers around for family events. We love the organic quality the tiles lend to the kitchen. The bright blue is lively and upbeat but the unique characteristics of each tile feels very genuine and real. It’s interesting because those are the words we would use to describe the rest of the house as well. The eclectic mix of colors compliments the wall of beautiful built-ins perfectly. The color balances the brown and creates a nice layered look. We love the rich hues and mix of textiles and surfaces. The shelves are an assortment of family heirlooms, photographs, interesting books and treasures collected from around the world. The furniture is bold and charismatic, beckoning you to come sit, relax and enjoy the natural light which warms the spaces. This master suite could be in Nashville, LA, Barcelona, or anywhere else in the world. The modern mix of prints, color, texture, fabrics, textiles, surfaces is truly international. We love the floor to ceiling tiles and emphasis it adds to the bed. You feel transported to another part of the world. This gorgeous wallpaper actually started as a ceiling accent but it was so cheery, warm and unexpected, we had to extend it down the walls as well. We love the pattern and the soft glow it lends to the space. Its a perfect compliment to the grey custom designed storage. The guest suite designed for our client’s daughter is an intentional departure from the vibrancy of the rest of the home. Bathed in neutrals and serene natural elements, the guest suite is the perfect tailored to their daughter’s aesthetic. What a nice gesture to design for your most sought after guest! Last but not least, here is the accompanying bathroom as part of the guest suite. The soft, serene environment is continued and we couldn’t be more pleased with the balance, tone, and texture of the space. All and all, this house manages to find the right balance between vibrant eclectic and modern, serene and contemporary. Designed to match the personality and lifestyle of its family, this custom home will welcome many, offer a backdrop for happy memories and engulf the owners in joyful celebration of life, heritage and family. Hope you enjoyed the tour! Though we are only a month and a few weeks into the year, there is a lot to LOVE about 2017. Clients are always at the top of the list but this year we wanted to throw in some surprises as well. After all, interior design is about expanding our horizons and sharing our inspiration! Here’s to a wonderful, love fueled year. Thank you! We have a lot of buns in the oven, so to speak, and this year is turning out to be quite exciting already. Here is a roundup of some of our latest loves and obsessions. Interior design is all about creating unique interiors for our clients. No two project is the same because no two clients are the same. Interior design is really all about combining different design elements in unique ways to create fun, dynamic spaces. Nobody pays us to shop a catalog for them. Rooms that aren’t full of diverse elements sourced from vendors producing goods literally all over the world fall flat. We love how design inspires us to explore the world, explore different styles, and bring them all together. It is no secret BHD loves the color green. Greenery, green, to be exact. 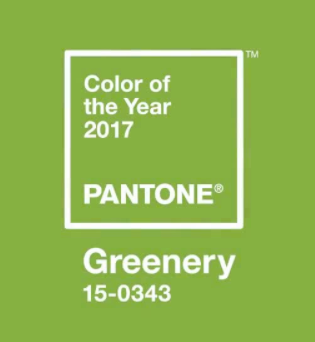 We know Pantone can’t choose the same color year after year, but we have. I bet they wish they could too! Here is Greenery in action. We love how the color pairs with natural wood and the custom white built-ins. Fresh, lush, and natural, just the way we like it! 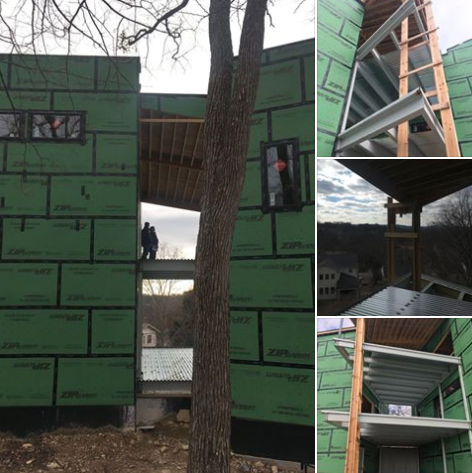 We are absolutely wild about the progress of our client’s home! This tree-house, as we have affectionately referred to it, features a two-tiered bridge connecting the main house to a separate dwelling containing an office on the main floor and a guest room on the second floor. Right now you see the temporary supporting structures, the corrugated sub-floor for the concrete flooring, and the stunning cantilevered roof atop the terraces that bridge the structures. We are proud to be working alongside Manuel Zeitlin Architects and Keystone Building Group in producing this art piece amongst the trees. Every corner is full of pieces we love. 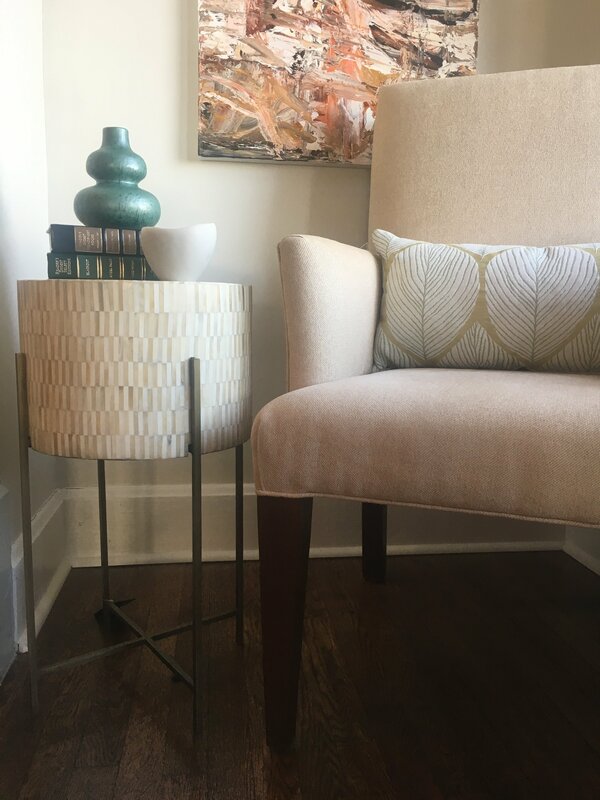 Here we have a great bone inlay table paired with a neutral side chair, graphic pillow, some chic accessories, and art. Perfectly complete. 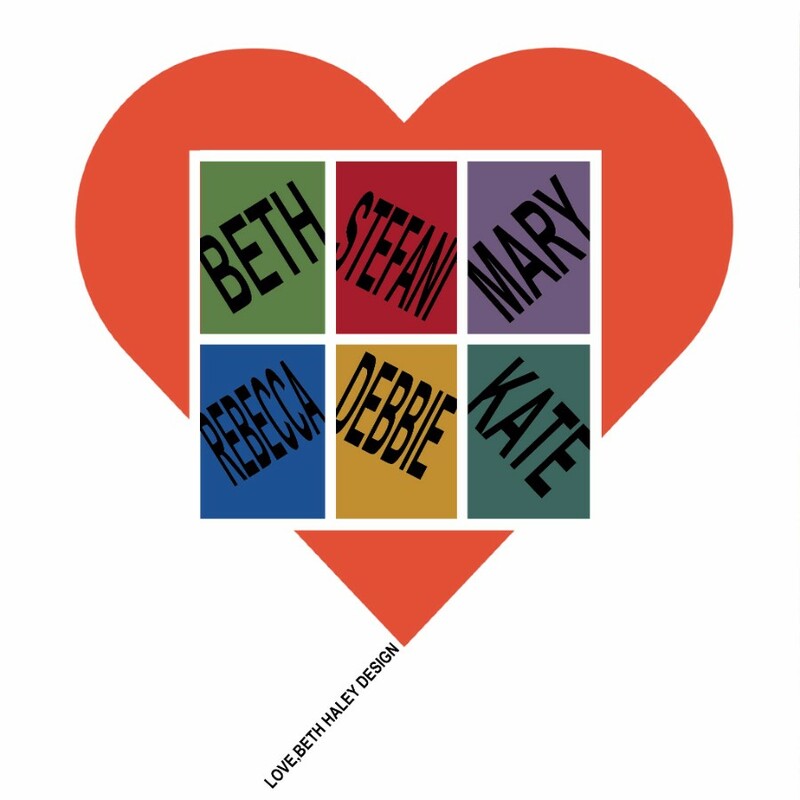 If you haven’t come by to visit us in a while, stop by sometime this week for some valentine’s treats! DesignWild, an up and coming Nashville artisan recently came to our office and completely knocked our socks off with a product we’ve never seen before. 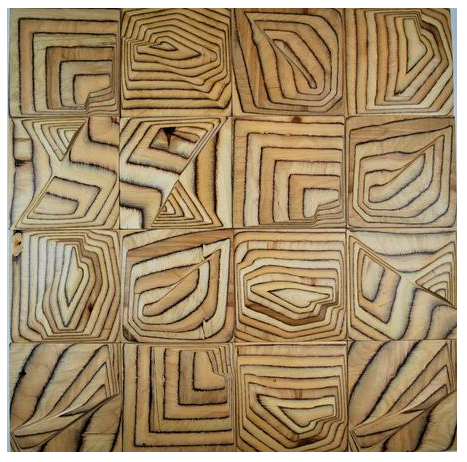 David Wildman creates intricate architectural wood wall tiles that are innovative, unique, and true show stoppers. We love the texture they would give to a space and each tile is a work of art in itself. We’ve added it to our design arsenal of things we love and can’t wait to share with our clients!